This morning I turned to the final folio in Matthew’s Gospel—the last two pages. That’s all that’s left to preach in this series. It has been a wonderful journey—for me personally, hopefully for our congregation as well. Without a doubt, the predominant theme of Matthew’s Gospel has been the kingship and authority of Jesus Christ. The book opens by announcing his birth as the long-awaited king. “Where is he who has been born king of the Jews?” (2:2). Jesus launched his ministry by declaring that the kingdom of heaven was at hand. He demonstrated his royal authority through his teaching, his healing, and casting out evil spirits. He revealed the hidden nature of the kingdom through his parables. He entered into Jerusalem his final week lauded as a king. Finally, the book closes with Jesus’ own words, “All authority in heaven and on earth have been given to me” (28:18). There is no mistaking the point: Jesus is the King of heaven and earth. Yet as the book draws to a close, two themes collide that seem otherwise foreign to each other: kingship and cross. We don’t normally see those together. Yet as Matthew’s Gospel concludes, he makes clear that if you don’t understand kingship in light of the cross, then you’ve missed the point of his book. Growing up in our American democracy, our basic idea of kingship today is generally somewhere between Disney and Prince William and Kate Middleton. Somewhere between fairytale and figurehead. A life of luxury were everything goes well and people write books about you (or at least put you in the tabloids). And yet at a deeper level, we have pretty strong expectations about how a king should act. Kingship is a matter of glory, power, honor, wealth, and prestige. An office that demands respect, and wields a power that ought to be able to thwart suffering and opposition. Certainly, no self-respecting king would let themselves get nailed to a cross. We tend to have a rather sanitized view of the cross in our imagination today. We think of it in terms of a pretty decoration on a church building, or nice piece of jewelry around our neck. It’s easy to forget that in the ancient world the cross was an instrument of torture, a means of public execution (not unlike a hanging in the Wild West). And so when we read Matthew 27, it feels like Jesus’s claim to the throne that has permeated the book is now being undone. How could anyone condemned as a rebel in such a humiliating way claim in any real sense to be king? The cross is a contradiction to kingship. If Jesus were really a king, he wouldn’t let this happen. The irony is thick, on several levels. On one level, they’re being ironic in their words to him—mocking his identity. And yet on another level, the deeper irony is that what they say in gest is in fact true. Jesus is the King, and he’s proving it not by coming down from the cross, but precisely by staying on it. It’s on the cross where Jesus’ royal identity is publicly displayed for the entire world to see, written in three languages—Aramaic for the Jews, Latin for the Romans, and Greek for the rest of the nations (Jn. 19:20): “This is Jesus, the King of the Jews” (Matt. 27:37). As N.T. Wright puts it, “What for Pilate and the soldiers was Jesus’s ‘crime’—his claim to be Israel’s true king—was for Matthew the sober truth. 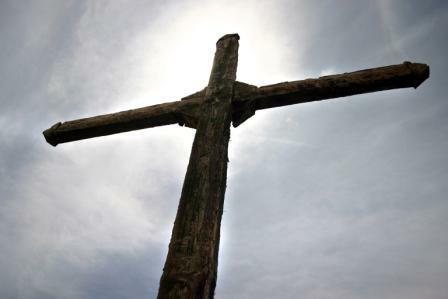 And the crucifixion was the means by which his kingdom would be established.” It’s on the cross where he will do what is necessary to bring God’s heavenly kingdom to dawn on earth. And it’s on the cross that he shows us what a real king is like. Think back to Jesus’ conversation with James and John in Matthew ch. 20, when their mother came and asked Jesus if they could sit on his right hand and his left in his kingdom. Their assumption, like so many of our assumptions, was that the kingdom was a matter of glory and power. But remember what Jesus said to them: “‘You do not know what you are asking. Are you able to drink the cup that I am to drink?’ They said to him, ‘We are able.’ He said to them, ‘You will drink my cup, but to sit at my right hand and at my left is not mine to grant, but it is for those for whom it has been prepared by my Father’” (20:22-23). And then we see exactly what Jesus meant in Matthew 27:38: “Then two robbers were crucified with him, one on the right and one on the left.” Think about what Jesus is saying: this is the moment at which he comes into his kingdom. The cross is his throne, and he’s flanked not by his apostles, but by those appointed by his Father: a couple insurrectionists. He is “numbered among the transgressors,” as Isaiah 53 puts it. It is through the cross that Jesus accomplishes the work he came to do in bringing God’s rule and reign to bear on this fallen earth. It’s through the cross that he is inaugurating God’s heavenly kingdom, beginning God’s new creation. Kingship and cross are not at odds; they are intimately and inextricably held together. But why the cross? Why suffering and death? If we look again at the same conversation in ch. 20, Jesus has already told us: “even as the Son of Man came not to be served but to serve, and to give his life as a ransom for many” (20:28). What is a ransom? It’s the price necessary to buy someone out of slavery. Slavery to what? Jesus clarifies this when he says something similar during his last supper in ch. 26: “for this is my blood of the covenant, which is poured out for many for the forgiveness of sins” (26:28). We need to be ransomed and redeemed from our sin. Jesus’ death on the cross does not just model for us a new way to live (though it does that, cf. Phil. 2:5-11); it is the means by which God deals decisively with the greatest problem in this fallen world, and thus the greatest enemy to his kingdom: sin. The darkness that hung over the land during the crucifixion was a sign of God’s divine judgment, poured out on Jesus in our place. And so it is that when Jesus cries out from the cross, “My God, my God, why have you forsaken me?”—that’s where we see the real pain of the cross. Not just physical brutality, but the separation, the forsaking, the broken relationship between Heavenly Father and Eternal Son, during which time the Father poured out upon his Son the full weight of his holy anger and wrath against all human sin that ever has been or will be committed. In those three hours Jesus bore hell for us. Our king took our place in death that we might be able to enter his kingdom and have life. Jared Wilson captures the beauty, significance, and emotional weight of Christ’s sacrifice for us with an illustration. Imagine you are driving down the road and your car stalls at a railroad crossing. You are understandably nervous as you try to reignite the car’s engine, but you become even more so when you see a train turn the corner in the distance began quickly closing the gap between it and you. The train’s engine horn is blaring in the engineer has thrown on the brakes, but you’re too close and he’s coming too fast. You move from trying to get the car to start trying to unfasten your seatbelt, but fear has made your hands stiffen and shake. You can’t get your seatbelt unfastened. The train is rushing toward you, and you know you’re going to be hit. And you are. Suddenly and from behind. A man in a truck behind you has decided to ram into your car and push you off the tracks, even as he’s destroyed by the impact in the very spot you once occupied. This is but a hint of the love of Christ for us. This is a picture of a king who rules through the cross. A king without a cross sits behind you and honks, yelling at you to get yourself off the track. ‘Save yourself, so that you can get back to serving me!’ In fact, that’s how every substitute king, every alternative to Jesus, ultimately rules. If your king is your job—if that’s what you look to for life, identity, significance, and satisfaction—then every time you walk into the office your car stalls, and you spend your day trying to get yourself off the track before the train hits, while your boss sits behind you and honks. If school is your king, then you spend every class stalled on the tracks, and every test is another train threatening to undo you. If your kids are your king, and your identity is caught up in what others think of them, then every time they go in public, your car stalls on the tracks, while you yell and honk at them to get you off before you’re destroyed. There can be no peace in a kingdom without a cross. There is only force and fear. But Jesus came not to be served, but to serve, and to give his life as a ransom for many. Jesus may look like he’s losing—and he is. He’s been abandoned by his followers, rejected by the Jews, crucified by the Romans, forsaken by his Heavenly Father. He doesn’t just seem to lose, or seem to suffer and die—he does! But it’s through dying that he will win. It’s not by coming down from the cross but staying on that he asserts his true kingship. And when he rises from the grave three days later, he will bring with his resurrection the dawn of God’s new creation. Jesus establishes his kingship not through fear and force, but through the self-giving love of the cross. And his love is for you. N.T. Wright, Matthew for Everyone, Part Two (Louisville: WJK, 2002, 2004), 182. Jared Wilson, Gospel Wakefulness (Wheaton: Crossway, 2011), 25. ← How Should We Think About the Ebola Crisis? Have a warm and meaningful Thanksgiving. P.S. : Do you keep up with Vern Steiner? Thanks Will! Thanksgiving blessings to you, too. Yes, I try to connect with Vern when we are home visiting family, though it’s been a while. Continually thankful for his friendship, and for yours. Blessings.